Fuzzball & Scuzzball - Midnight! And so we come at last to this, the penultimate episode of The Blasphemous Totem of Aranzool. 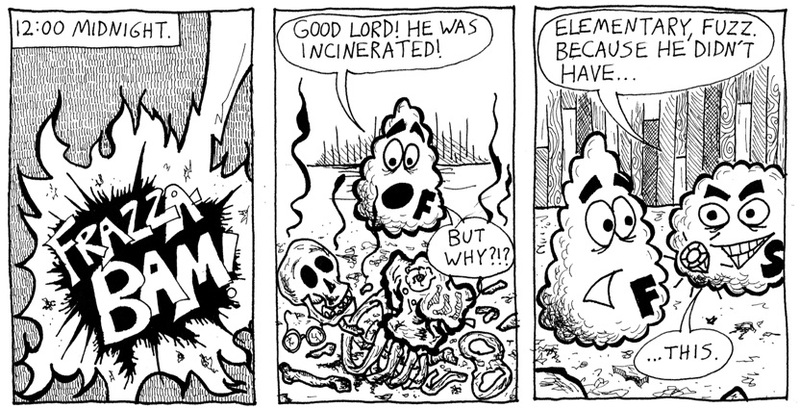 As I've mentioned before, I drew this comic about ten years ago and serialized it on a different website where, unfortunately, almost no one read it. This time, though, I've gotten several responses from people, real human beings who are reading the story, so I'm glad I dug it out of the closet. As I drew near the end of this story, I was faced with a problem. Fuzzball and Scuzzball had to, at least in some way, play a role in bringing about the conclusion. Deus ex machina endings are disappointing. But Fuzzball and Scuzzball are largely incompetent. How could they possibly save the day? I was pleased with this solution. The ritual doesn't work--which means the villain explodes, the totem is ruined, and the city is saved--because Scuzzball took a gem off the totem. But he didn't do it because he was planning ahead, he did it because he's greedy. Thus the protagonists are active yet still not competent. Success!